I made the most fantastic discovery today. The kind of discovery that changes your mood for the better. After lunch and a brief walk around Cal Anderson Park, my colleague Nathalie Graham and I prolonged our lunch break just a little bit to get coffee at General Porpoise Doughnuts. It was there I encountered one of the silliest (and truly astounding) pieces of art I think I've seen in my (relatively short) tenure as a visual arts writer at The Stranger: this relatively unassuming painting hanging just above a carefully curated shelf of lids, tulips, sugar cubes, and brass spoons. There are so many things that make it great. The painting is immediately "get-able." The store is called General Porpoise Doughnuts. 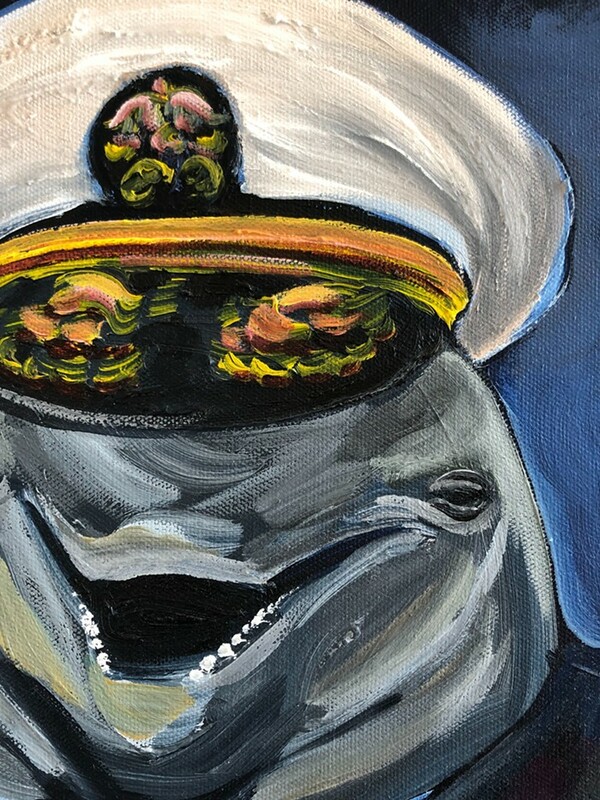 This is a portrait of a porpoise as a general. It's kitschy in the most endearing of ways. A close-up of the painting reveals a lot of emotion—broad vivid strokes of color seem to melt into each other. I've never considered myself to be a patriotic person or particularly moved by any portrait of a member of the armed services—but this really got me in my feelings. I guess you can say it served its porpoise. 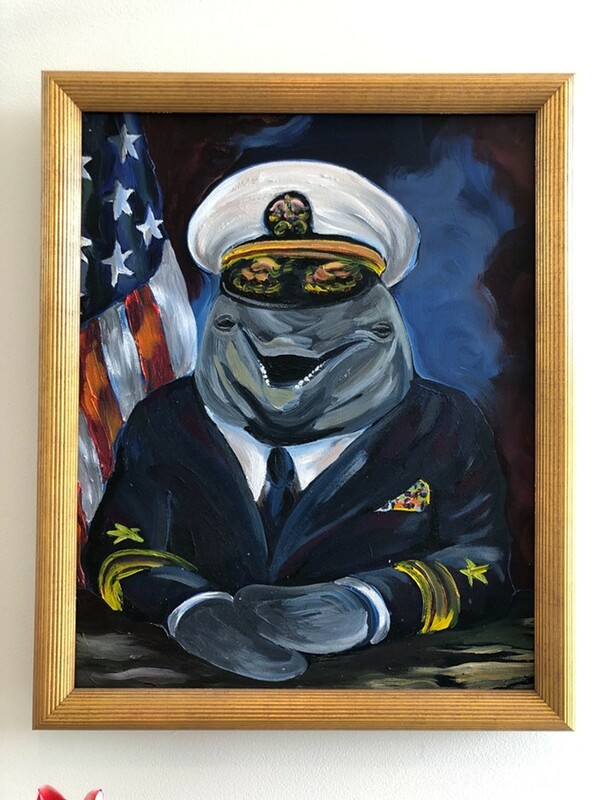 I excitedly asked the baristas if they knew who was responsible for this brave and stirring painting of a dignified small-toothed whale. They said they'd get back to me. When I rushed back to Stranger World Headquarters, I thrust my phone in my colleagues' faces, eager to show them what I'd found. 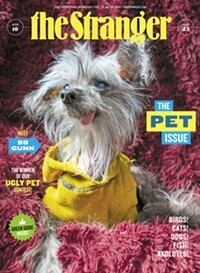 "It looks like something you'd see in Florida," managing editor Leilani Polk—a St. Pete, Florida, native—commented. Chase Burns, another Stranger editor and St. Pete native (weird), nodded his head in agreement: "It's true." Nathalie thought the whole thing gave off intense BoJack Horseman vibes. I think they are all correct. 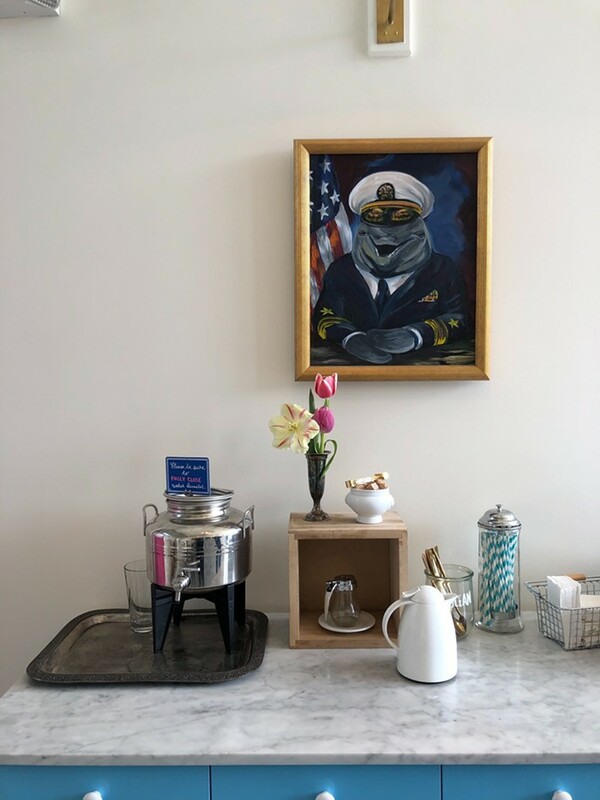 In any case, if you find yourself with a deep need to see something awesome on Capitol Hill, I'd strongly suggest you pop over to General Porpoise Doughnuts to check out the one and only General Porpoise. The coffee's good, too. If you're the artist who painted this, please step forward! I wanna know all about you!